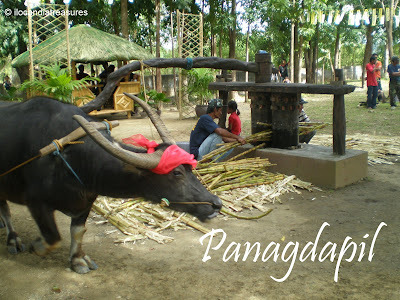 Its around this time of summer that panagdapil is being conducted. Around the months of November and December where farmers start harvesting their sugar cane and initially do the dapil. Panagdapil is the process of extracting sugar cane juice from its pulp using a conventional or a modern machine. The use of traditional type of dapil is getting rare nowadays since modern machines are much more convenient. With the old type, they employ the service of a carabao to pull the wooden dapil to rotate clockwise while the farmer is busy inserting the sugar cane stems to be pressed. The juice flows down as they collect it into a big pot or silyasi. If they have collected enough then they heat it through the fire. The heat varies depending on what product you want to achieve. Slight heating is necessary for making basi or the wine followed by suka or vinegar. Further heating is required to turn it into molasses ready for kalti. It’s a way to dip papaya strips, malagkit to make cascaron for snacks. Silamot is a term use to pinch the cooled molassess and eat it. Everyone in the neighborhood helps to make this happen and party over the kalti and silamot. I had the chance to witness and take part in the conventional way of panagdapil during the San Nicolas Fiesta on December of 2007. I had the chance today to visit the Bangui Windfarm with my friend Roel who dropped by from Manila just to see the windmills. Its becoming very popular since it appears on newspapers and magazines and had been a location site for the pictorial of a popular brand of apparel. We took a jeepney ride from Laoag City which costs Php60 per person. We alighted at the Baruyen Bridge where you can see the marker of the windmills. There were some tricycles available for rent for Php30 which can take you to the actual site. These gigantic white structures never cease to amaze the visitors. Its my second time to get up close to them but it’s still the same feeling I felt. This man-made site is truly awesome. I can’t believe my eyes that at my own home province I can find these which I only saw in Amsterdam, Belgium and Germany. There are 15 wind turbines which are placed in a single row along the coast of the Bangui Bay. They were planted on a distance of 326 meters apart. It is 70 meters high equivalent to 23 storey building and the blade is 41 meters in length. To get the optimum benefit of the winds, they were positioned facing the sea. This windpower project was developed by the Northwind Power Development Corporation to ease global warming by reducing emission of greenhouse gases and advance the rural electrification of the government. 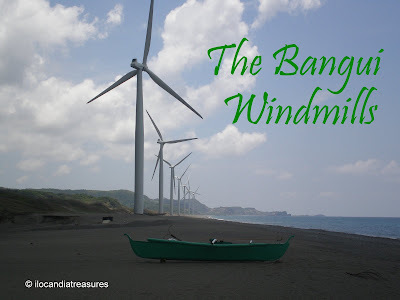 This is the first commercial windfarm in Southeast Asia. Laoag City’s entry into the float competition of this year’s Aliwan Festival emerged as the grand winner. The competition was held on the first week of May at the Quirino Grandstand beside Cultural Center of the Philippines in Manila. 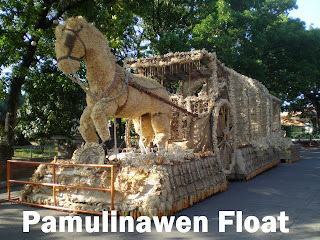 The Pamulinawen Float depicted a horse carriage which is a traditional transport in Ilocandia. Many calesas are still operating in Vigan and Laoag not only as a regular transport but serves tourists on their strolling activities. Its depiction in the float had the purpose of promoting its preservation. The float was made of garlic, corn materials such as the grains, husks, leaves, and others. After the competition in Manila, it was brought home to Laoag and displayed infront of the city hall. The locals had the chance to get a glimpse of this wonderful work of art. I too had seen it up close. After our Cebu Pacific flight 5J553 touched down at Mactan Airport at 11:20AM, I went directly to Waterfront Hotel in Lahug to see Vinnie. This was my third time to visit the island. We went out for lunch together with his Singaporean friends at Ayala Mall. I had a plate of red seafood pasta. At the Spaghetti Factory we noticed an unusual big size of a pepper mill used by the waiters. We also saw at the grocery singing group of blind men serenading customers. It was my first time to see it on a grocery. Late afternoon, I went around town and have seen the Cathedral, the Basilica Del Sto Nino and the Magellan’s Cross. I went for dinner at SM foodcourt at Marina, ate grilled sweet blue marlin. I waited for my Asian friends at the hotel lobby since they went for a dinner program for the SSEAYP International General Assembly (SIGA). I saw my Singaporean foster parents Ibu Intan and Aya Mansuri and grandkids and followed by my friends Masa, Miho, Macchoi, Meng Wai, Jeremy, Chan, Miles, Cris, Atchee, Aldean, Rostam, Pam, John, Daniel, Francis, and many others. I went out with my SSEAYP batchmates for a night out at the bars in Mango Avenue. We had a few bottles of beer. We called it a night at 3AM. I took a short sleep then headed to Bohol Island. I took the Weesam, a fast seacraft at 7AM, the first trip that took us 1.45hours to reach Bohol. I paid Php400 plus 25 terminal fee. I went straight to Carmen Bohol upon my arrival in Tagbiliran. The bus took me 1.15 hours to Carmen for Php50. This was my second time to visit the island. The island is still the same awesome place I have been to in 1994. It was totally uplifting to see for the second time the amazing Chocolate Hills. This was created by the millennia of water erosion on limestones atop impermeable clay that formed the limestone humps distributed all across the center of the island. These hills come in brown color like the chocolate color during summer period and turn to green in rainy season. This is another wonder that the Philippines treasure. After enjoying the sight of the Chocolates Hills in Buenos Aires, Carmen Bohol, I proceeded to Batuan to visit my former mentor, Dr Consolacion Vinluan, who is a town councilor and the president of the Batuan Colleges which grew bigger as what I have seen when they started it on my initial visit. I saw also Yvonne, my collegemate who is the niece of my mentor. They fed me with lunch. It seemed that they would want me to stay for the night but I have to go back to Loboc to see the tarsiers. Finally, I saw the Philippine tarsiers, smallest primates which I did not see before. I enjoyed viewing them on a cIose up. Some visitors fed them with insects which the tarsiers enjoyed. From the same town of Loboc is the popular Loboc River where you can enjoy a cruise by renting a boat. You can also dine in a floating restaurant. The town is the origin of the internationally award winning Loboc Children’s Choir. I bet that most people here are good singers just what I noticed from my first visit. All of the vessels bound for Cebu were all fully booked just because it’s the peak season. They have numerous visitors during the summer period. Luckily, they had a special trip at midnight which I took and slept in the ferry. The slow seacraft took 4 hours. I paid Php185 for a sitting positing. When I got back to Cebu, I went to Fort of San Pedro which was still close. Went around further by a walk. I visited again the Magellan’s Cross, the Sto Nino Church where I attended a morning mass on a Cebuano dialect. I walked along the Carbon Street looking for dried fish but to no avail. I took my breakfast at a restaurant here. I bought a ukulele for Php270 and some otap, a native delicacy. I rushed to the airport for my flight to Clark. I saw Atsuko, Reiko-san, Masa, Tomoko and company who were bound to Tokyo via Manila. I met the Malaysian group who attended SIGA on the same flight with me.